Advantage Research Monitoring offers a unique set of commissioning offerings. Contained in one firm are competencies in building envelope, mechanical, plumbing and electrical commissioning. Many commissioning providers have great mechanical competencies but know little about building envelope and electrical systems. We diversify our experience and knowledge across all of the energy related components of a building. > The building envelope is composed of the materials and assemblies of a building that separate the interior building environment from the exterior environment conditions. A poor envelope will cause the building HVAC system to use much more energy than was originally anticipated. This has been recognized by the USGBC; therefore, the 2013 LEED requirements will include that building envelope commissioning must be a part of Fundamental Commissioning. Some of our staff has had experience installing and commissioning the building envelope. Do not rely on others to commission your envelope when they know little about how an envelope functions and is built. 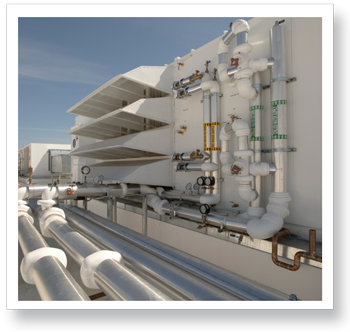 >Mechanical commissioning entails the entire HVAC, plumbing and controls systems. Many times these systems are carefully installed and then poorly tested. Sometimes the systems are poorly installed and testing is a failure before it is begun, therefore testing may be little to no benefit. Also, the HVAC and controls are often set up incorrectly as a system since most of the requisite installers are only competent in one or two components of the system. A successful mechanical verification takes a commissioning agent with systematic knowledge of all components and how they are to interact and work as a complete system. The commissiong agent assures the system is operating correctly and that the O&M staff understands the correct opreration. > Electrical commissioning, many times, includes only lighting controls and standby/emergency power generation. Electrical commissioning can also include switchgear, panelboards, transformers, grounding, etc. Similar to mechanical, the varied electrical components must work together as a complete system. Electrical failures can cause outages, grounding related issues, etc. Building Commissioning is the systematic process of verifying and documenting that a building's systems are designed, installed and operating to meet the Owner's Project Requirements. Basically, commissioning is assuring the Owner that a building's systems perform as they were originally intended to perform. Commissioning has a multitude of benefits. First and foremost, commissioning assures that the building is using the least amount of energy possible while maintaining the correct operations of the systems. Studies have shown that commissioning commonly has less than a 5 year payback just on energy savings alone. Additional benefits of commissioning include lower operating costs, reduced contractor callbacks, better building documentation, less change orders, improved occupant productivity and better Facility personnel training.